Nova’s Blend: Essential Oils for Growing Pains and Sleep. I’ve been using essential oils therapeutically only this year. Before that I used cedar oil to clean my bathroom and lemon for floors and counter tops mostly because I love the smell. Thanks to a friend with Young Living and a friend with its rivalry company Doterra, now I’m using them to ease discomforts in my family. 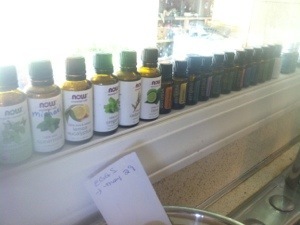 The more I use essential oils, the more I realize how much I undervalued their power. Now I am seeing results and I believe! And I also love how wonderful they smell. I love the idea of concentrating pounds and pounds of a plant into one little bottle. It feels like magic medicine at my finger tips. My mother in law was telling me about how her mother use to rub wintergreen on her and her sister as children to ease aches and pains. Growing pains. My daughter who is four experiences what she describes as restless leg aches and growing pains. Feeling nostalgic about Grandma’s childhood wintergreen rubs from Great Grandma, I decided to order some. I was already using lavender mixed into coconut oil for her to help with sleep. When the wintergreen came I mixed the with the lavender. The scent is heavenly and the rub really helps her. She ends up falling asleep within 5-10 minutes of application. My daughter also loves that I developed that specific blend just for her. She calls it “my oil”. I love old wisdom.